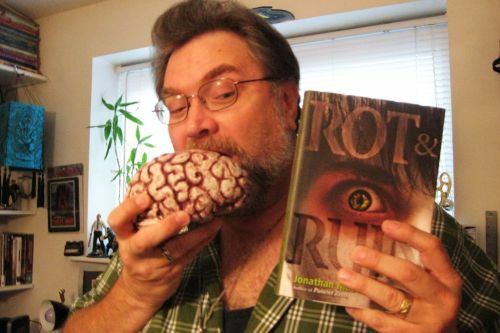 Jonathan Maberry is an American author of horror fiction, thrillers, comic books and non-fiction. He is best known for his Pine Deep Trilogy, Joe Ledger series and his Benny Imura series. He has also written several non-fiction books about the paranormal, such as vampires and zombies. Notes: Murdermouth: Zombie Bits also contains contributions by Jack Kilborn and Scott Nicholson. Possessed: Spine Tingling Tales From Ten Masters of Horror also contains contributions by Maria Alexander, Kealan Patrick Burke, Joe McKinney, Lisa Morton, Joseph Nassise, Scott Nicholson, Jeremy C. Shipp and Simon Wood. Marvel Zombies Return was co-authored by several other authors. They Bite and The Cryptopedia were co-authored by David F. Kramer. Wanted Undead or Alive and Vampire Hunters and Other Enemies of Evil were co-authored by Janice Gable Bashman. Four Summoner’s Tales also contains stories by Kelley Armstrong, Christopher Golden and David Liss. SNAFU: An Anthology of Military Horror also has stories by Greig Beck, David Benton, Curtis C. Chen, W.D. Gagliani, Tyson Mauermann, James A. Moore, Christine Morgan and Weston Ochse. SNAFU: Heroes also has stories by James A. Moore, Joseph Nassise and Weston Ochse. Indigo also contains contributions by Kelley Armstrong, Christopher Golden, Charlaine Harris, Tim Lebbon, Seanan McGuire, James A. Moore, Mark Morris, Cherie Priest and Kat Richardson. Baker Street Irregulars was edited with Michael A. Ventrella. Nights of the Living Dead was edited with George A. Romero. Joe Ledger: Unstoppable was edited with Bryan Thomas Schmidt.